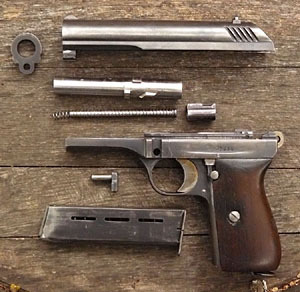 By early 1924 Ceska Zbrojovka (CZ) had taken over the manufacture of the vz.22 pistol from Czechoslovak Zbrojovka (previously known as Zbrojovka Brno), which had been working to perfect Joseph Nickl’s design since 1920. According to Berger, Czechoslovak Zbrojovka had virtually no experience in manufacturing pistols and was not using modern manufacturing techniques that would allow for complete parts interchangeability. Additionally, it was trying to mass manufacture a pistol that was essentially still in the prototype stage. Ceska Zbrojovka (CZ) had to redesign the pistol for two reasons: 1) to adapt production to the existing machine tools at CZ, which would serve to speed production and reduce costs and, 2) to meet the demands of the Czech Armament Commission to make the gun reliable enough to serve as a military weapon. The most important changes were the addition of a disconnector and a magazine safety, which had been notably lacking on the vz.22. The manual safety lever, safety release, slide retention pin, and side plate of the new design were stamped instead of milled. The cradle that the helical lug of the barrel turns on was redesigned to be symmetrical (i.e., reversable), and a stop lug was added to the barrel. The trigger design was simplified, the barrel and slide were lengthened slightly, a set screw was added to the side plate, the front sight profile was changed, and the rear of the ejection port was rounded instead of straight. Two-hundred pre-production pistols were delivered to the Czech Armament Commission for testing in May of 1925. The Commission approved the design by August of 1925, and the redesigned gun was designated the vz.24. The first government order for 20,000 vz.24 pistols was completed in June of 1926. According to Berger, by the end of 1929 a full 100,000 pistols had been delivered to fulfill additional government contracts, though Ezell states that they were not delivered until 1931. An additional 1400 were made in 1935, and 70,000 were made between 1936 and 1938 to fulfill later government contracts. CZ’s intention had been to sell the gun commercially, but very few sales were ever made outside of Czechoslovakia. Approximately 1700 were sold to Poland, and another few hundred to Lithuania. 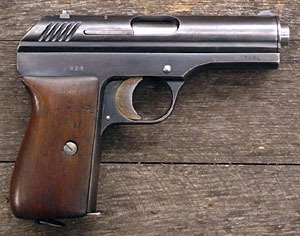 A nine-shot extended grip-frame version of the vz.24 was manufactured between 1929 and 1931, some of which were fitted with a combination shoulder-stock and holster. The nine-shot vz 24 pistols were given a separate serial number range from 1 to approximately 3100. A small number of regular 8-shot vz.24 pistols in the serial number range from 95,000 to 115,000 were also fitted with shoulder stocks. These guns were likewise made between 1929 and 1931 and are marked with an “A” in an oak leaf on the trigger guard. The standard inscription is on top of the slide: CESKA ZBROJOVKA A.S V PRAZE, followed by the serial number and the military lion acceptance mark. The serial number is repeated on the right side of the frame just behind the muzzle, on the removeable side plate on the left side of the receiver, and on the barrel. A probable factory mark is the čz with a fletched arrow between the letters, which appears on the frame, slide, sideplate, and barrel. Barrels may also have various proof stamps. The last two digits of the year of acceptance by the military are stamped on the frame and slide. The front of the grip strap has engraved numbers and letters that indicate the military unit to which the gun was assigned. For instance, the example shown here has 154 D 554, which represents the 154th regiment or section, D for artillery, and the 554th gun assigned. A full list of letter code designations are found in Berger. 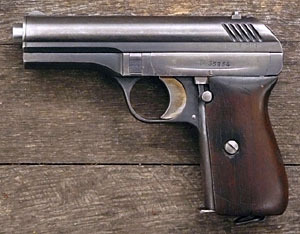 A small number of vz.24 pistols were manufactured during the German occupation in World War II. These guns do not have serial numbers or any markings other than CESKA ZBROJOVKA A.S V PRAZE on top of the slide, though they do have a Waffenamt proof mark on the barrel. 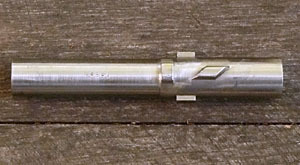 The barrel of the vz.24 has locking lugs on either side, just in front of the chamber, a helical lug on the underside, and a transverse stop lug. The helical lug engages a matching helical slot cut in a removeable cradle. The cradle fits into a slot in the frame just above and in front of the trigger, and the underside is tubular so the recoil spring and guide rod can fit into it. The cradle is pinned to the slide. The slide has two offset longitudinal grooves on the interior into which the locking lugs of the barrel fit. At the end of each groove is a transverse slot in which the locking lugs rest when the slide is closed and the breech is locked. When a cartridge is fired the locked barrel and slide recoil together for only about one millimeter before the helical lug, moving in the cradle, begins to rotate the barrel counterclockwise and unlock the breech. Total movement of the barrel during recoil is approximately 9 millimeters. Barrel movement is halted by the stop lug abutting the front of the cradle. Once the locking lugs disengage from the locking cuts, the slide is free to recoil on its own. As the slide recoils, the shell is extracted and ejected, and a new cartridge is fed into the chamber in the usual manner. This is a delayed blowback system wherein the breech begins to open before the bullet exits the barrel. appear to be checkered plastic with the CZ monogram. With magazine empty, retract the slide. The slide will lock open, relieving tension on the pin that retains it. On the right side, press in on the protruding end of the retaining pin. Slide the left side locking tab down, out of the frame, and pull the pin out from the left side. Hold the slide back with one hand and remove the magazine with the other. Ease the slide forward off the frame. Turn the barrel bushing approximately 30° and remove it from the slide. Remove the barrel through the front of the slide. There is no need to remove the sideplate for normal cleaning. R.K. Wilson says of the vz.24 that it is “...well thought out in every particular. It is extremely well made of first class material...,” and it “...groups very well and is quite easy to shoot with.” His only criticism of the vz.24 is that its grip is too square to the frame and therefore the gun does not point naturally--but he says it isn’t as bad as some guns, such as the Steyr-Hahn 9mm. Firearms Identification, Vol. I, by J. Howard Matthews. Charles C. Thomas, Springfield, IL. : 1962. Know Your Czechoslovakian Pistols, by R.J. Berger. Blacksmith, Chino Valley, AZ: 1989.